Connection Initiation Overhead is Killing Your Web App - Use a Connection Pool – Command Prompt, Inc. If you think that your application wants more connections and you are considering raising max_connections, then you need to understand that connections carry overhead. This is a generalization: there is overhead of initializing each connection, there is overhead of maintaining an open connection, there is overhead of process concurrency in the OS, and there is overhead of concurrency in the database. Each connection corresponds to a separate operating system process and a separate TCP or Unix socket, and those things have their own hard and de facto limits in the OS as well. Connection initiation overhead can seriously impair common kinds of web applications that make database connections for each web request. In this common scenario, each connect-query-disconnect cycle is so slow that the architect solves the problem by increasing the number of concurrent connections. As mentioned above, concurrency brings its own problems. If you have a lot of these connect-query-disconnect cycles then you can probably dramatically speed things up by using a connection pooler and forget about raising max_connections. Here I share some simple benchmark results that illustrate connection initiation overhead. I did this by running a simple pgbench benchmark with and without pgbouncer, a connection pooler. Connection poolers are another subject of frequent confusion. Contrary to frequent first impressions, connection poolers do NOT allow a greater number of concurrent connections. Instead, they manage a pool of open connections that clients take turns using. The benefit is near elimination of connection initiation overhead, and this really speeds things up. 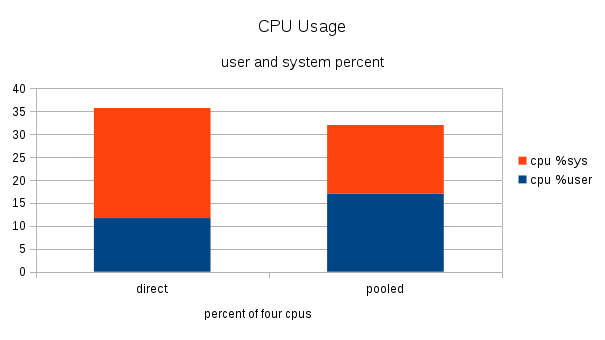 pgbench is a simple benchmarking program that ships with PostgreSQL. I used it to initialize a benchmark database with the default options. This creates a database only 22MB in size: that means the entire database will quickly be cached in memory after a few benchmark test runs. Run a single SELECT query. 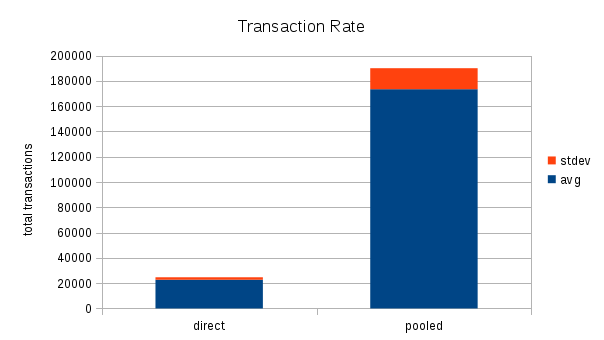 The benchmarks with connection pooling produced eight times more transactions while using less cpu time! Yes, connection initiation carries significant overhead, and a connection pooler is the solution.